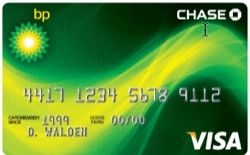 Like we mentioned earlier, this card used to give card holders cash back on a percentage terms1. Before the latest changes, you could earn 5% rebates when you make purchases at BP Amoco stations. Furthermore, you will earn a 2% rebate on every $1.00 of net purchases made at retail establishments that classify their merchant location for Visa/MasterCard as Dining (excluding retail establishments classified as Fast Food Restaurants), Airline, Auto Rental, or Lodging and a 1% rebate on all other net purchases. You can also earn unlimited rebates. At the moment, this is how the card works. For the first 60 days of your card activation, you will be able to save 25 cents per gallon rebates for every $100 on BP purchases. After the 60 day period is up, the savings drop to 15 cents per gallon of rebates for every $100 of spending at BP station. When you use the card at non-BP locations, you will earn 5 cents per gallon in rebates for every $100 that you spend. You can only redeem the rebates you have earn at BP stations. When you choose to redeem them, the price of your gasoline will be reduced based on how much rebates you have accumulated. However, the price per gallon cannot go below 10.9 cents per gallon. That means that you can never actually have a free fill! You must also not fill up more than 20 gallons to use the rebates. If you have more rebates than you could use, they will be carried over. But you have to use them within 12 months from the date you earned them. I guess this is BP's way of making sure you keep using the card. Comparing gas cards is a pretty interesting exercise. And the reason is because though most gas cards have now gone to the cents per gallon savings formula, there are still a couple that are still clinging on to the percentage of spending formula. Furthermore, there are non-station affiliated cash back cards that will either allow you to earn cash back or reward points at any stations. Let's start by looking other station affinity cards. The base earning rate of this card is 15 cents per gallon for BP gasoline and there is no tier or spending thresholds to earn this. 15 cents puts it in the upper bracket of the range among it's peers. For example, the Shell MasterCard lets you earn 20 cents per gallon, but only if you spend $2,499 a month or more, Spend less than that and you earn less. The Marathon Visa will allow you to earn 25 cents per gallon if you spend more than $1,000 a month on the card, 15 cents per gallon when you spending is between $500 and $999, and 5 cents a gallon when you card spending is less than $500. ExxonMobile's card also allows you to earn 15 cents per gallon. There are a couple of cards that still allow you to earn cash back on gas spending on a percentage basis. For example, the Hess Visa lets you earn 3% cash back at HESS stations. Gulf (mainly based in Pennsylvania) allows you to also earn 3%. The key question is whether 3% is better than 15 cents per gallon. And the answer really depends on what is the price of gasoline. If we assume $4.00 per gallon, the 15 cents works out to 3.75% cash back. If prices go higher, then the percentage savings decline and vice versa. The BP Visa is a pretty decent and good gas station card that will allow you to save money if you fill up your gasoline exclusively at BP stations. What I like about the card is that there are no spending tiers to meet to earn that 15 cents per gallon (unlike some other cards that we have mentioned). Based on current gas prices, 15 cents per gallon is also pretty competitive with cards that give rebate on a percentage basis. If you use BP exclusively, then this card will suit you. If you use other stations but mainly use BP, you might want to supplement this with another gas card that will allow you to earn cash back at all gas stations. One thing you have to be aware of is that you need good credit to get this card. Based on feedback from readers and other forums, it appears that a score of 700 and above would be good to get approved. If you have a 600+ score and are looking this card mainly to add another card to your wallet to build a better profile, then you might want to consider a card like the Barclaycard Rewards MasterCardÂ® - For Average Credit (2X on gasoline, grocery and utilities).